Onekama High School’s Robotics Team Rolls On! 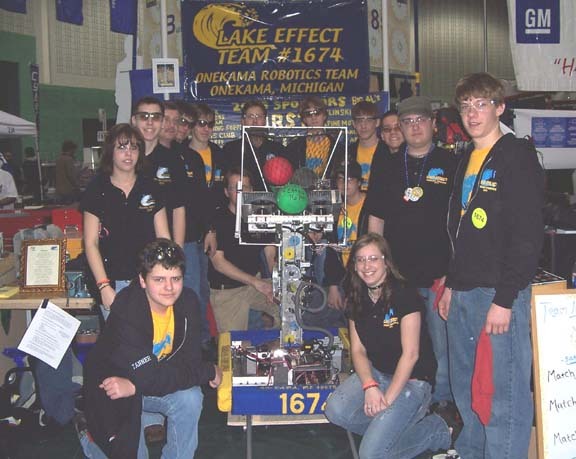 On January 6th Onekama High School’s Robotics Team went to Grand Rapids for the 2007 Kickoff where team members and their advisors gathered with students from all over Michigan to hear about this year’s competition. The game, for which all teams will build a device that will play, is called Rack-n-Roll. Onekama High School’s robotics team is a step into the future of education and once again Onekama is in the forefront of innovative technological changes. These young students will be able to help solve many problems that develop in the future by using the math, science, and technology skills they have learned in their experience with the robotics team. In any such effort local support involving the school, community, and businesses is crucial if our students are to develop the expertise to work effectively in the 21st Century. The team has six weeks to complete the assigned task and build the robot. They have been raising money through fundraisers, local events and with business donations for this year-long adventure. The students and their advisers/coaches are grateful for this support. A spaghetti dinner fund raiser will be held on Friday, February 2nd in the cafeteria at Onekama High School from 4:30-7:30PM. Pre-dinner tickets are available at the high school office or by calling 794-9589. They will also be available at the door. An Education Grant from the State of Michigan was recently awarded to the team through the untiring and skillful efforts of Mr. Megan McCarthy who wrote the grant application. Funding is only one issue that must be surmounted. The team is still looking for programming and electrical engineers to help with mentoring. Interested parties may call 794-9589 for more information. Your help and expertise would be most welcome. Mr. George Ford, a retired mechanical design engineer from General Motors, has been instrumental in working with the students, directing them on a path to success and the students would like to thank him for his tireless effort. Onekama High School’s Robotics Team will be attending The Great Lakes Regional competition in Ypsilanti, MI on March 8th-10th at Eastern Michigan University. Fifty-eight teams will attend this exciting event. If you really want to see what high school robotics is all about you would be wise to attend this competition.